CBD 3 Districts aka CBD 3D has its name from the wide spread genetic makeup covering 3 major districts, (Skunk, Afghan and Haze.) A complicated fragrance arises from an excellent Haze hybrid breeding true in CBD enrichment. 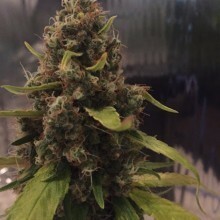 The flowering times are better than on normal Haze hybrids ranging from 9 to 10 weeks and the yields and compactness of the flower will be a pleasant surprise for the beginner to the most dedicated experienced grower. Ratios greater than 1 to 1 will be common and the concentrations of terpenes and cannabinoids will be a delight for anyone to possess this medicinal plant in their garden. For all types of people ranging from recreational users to cancer patients, it is a truly versatile plant.